Whether you decide to book your Greymouth car hire based on the convenient pick up locations or low prices, you can book directly with Avis, Budget, Europcar, Hertz and Thrifty at VroomVroomVroom. All available car rental deals in Greymouth are listed in our search results. Compare prices and find a rental car to suit your budget and needs. New Zealand jade, gold and beer are all parts of Greymouth's history. The West Coast is full of natural wonders, and Greymouth is the main service town. It's position makes it a great place to pick up a rental car. Why rent a car in Greymouth with VroomVroomVroom? Wide selection of cars: There are plenty of cars to choose from in Greymouth. Whether you want a compact car to save money, or an SUV to explore more of New Zealand, VroomVroomVroom can help you find the perfect vehicle. Great rates: Not only do we compare car rental rates from our suppliers in one place, we also provide the best price. Check out our Price Promise for more details. Convenience: Our depots have a map so you can easily find the nearest pick up and drop off locations. Excellent customer service: Our booking system is easy to use, but if you have any questions or need help in booking a car hire, contact our customer care experts via phone, email, or live chat. We have been helping people book a rental car since 2001. Weather-wise, the best time to plan an unforgettable holiday in Greymouth is in winter (June, July and August). During the winter time, the weather is pleasant and perfect for sightseeing and for those who enjoy the different activities this town has to offer. At this time of the year, visitors and travellers can enjoy the outdoor activities without feeling the heat or dehydrated. You can also visit the Greymouth during summer (December, January and February) and spring (September, October and November) as the seasons as they are normally mild. The travel time from Greymouth to Christchurch is more than three hours. A great idea is to travel to Greymouth from Christchurch on the KiwiRail TranzAlpine express. You will need a car in order to fully explore the township and the surrounding area in style and comfort, as some of its best attractions are off the beaten track. 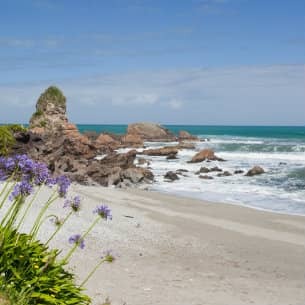 In Westport, a stunning scenic 90 minute drive away from Greymouth, you can experience all things Whitebait, and soak up some West Coast hospitality at the Westport Whitebait Festival. Is it your first time visiting New Zealand? Read our driving tips to help prepare for your holiday. Have you ever wondered what the heart of the rainforest looks like, off the beaten track? 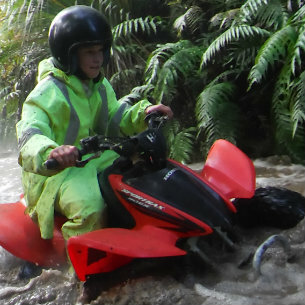 On Yer Bike Adventures has spent 20 years creating off-road paradise through their privately owned native rainforest. They have carved trails through their forest, carefully retaining the natural character of the area, where you will see huge trees, gorgeous views of the river valley, ferns and mosses that line the tracks. But the best part is the mud and water which naturally pools on the tracks. After a good downpour of rain, rivers of water will be flowing down parts of the trail and the mud is replenished for play. No need to worry about keeping clean as they'll supply boots and protective clothing to keep you dry. The adventures are on demand, 7 days, and the vehicle fleet includes quads, 1, 2 and 4-seater buggies, kid's quads and the mighty Hagglund. The property has been in our family for 100 years, farmed differently by each generation, so you'll see remnants of the past, as well as the present. They run sheep and cattle and who knows.. you may be roped in to help shift them to new pasture. After an invigorating ride on the vehicle of your choice, you can enjoy an espresso coffee in front of a warm fire, or browse the quilt shop on site. One of the world's most famous train journeys takes you on a spectacular route from Greymouth to Christchurch, past Punakaiki Pancake rocks, wild rivers, glaciers, a thick native forest, alongside the chiseled alpine landscape of the Southern Alps, deep into the gorge sides of the Waimakariri River and along the plains of the Canterbury farmlands. A 10-minute drive south of Greymouth you'll discover a recreated gold rush town based on the 19th century setlement that once existed on the West Coast. 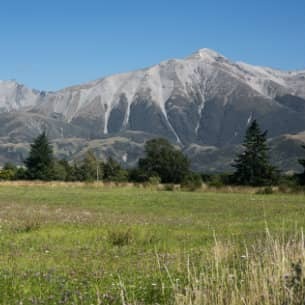 Dedicated to preserving the town's unique history, Shantytown provides lots of attractions including the Kaitangata, a restored engine which takes you to your very own gold panning experience (where you get to keep your winnings) and back to the pub where you can finish off with a cold one. Cheers! Selected as one of the Top 10 Coastal Drives in the world by Lonely Planet, this 90-minute drive from Greymouth to Westport takes you on a scenic journey through nikau rainforest, alongside the Tasman Sea, past wildlife and through little bustling townships such as Runanga, Rapahoe, Barrytown, Punakaiki, Fox River and Charleston - each offering something unique. Ranked #1 of the 20 hotels in Greymouth, this clean and modern accomodation offers quality at an affordable price. With MySKy, free Wi-Fi and luxury spa baths, its central location makes it a great base while you explore the region of Greymouth. Apart from the obvious comfortable, clean, modern facilities and rooms, this backpacker accommodation provides a quality experience that takes you to all sorts of exotic, fascinating places with its exciting and subtle collection of international artworks that fill this lively hostel. If you are in a camper, or have a tent packed away in the boot of your rental car, try this unique spot on State Highway 73, 45 minutes from Greymouth. It is strategically positioned between Christchurch, the West Coast, and the glacier country. You can view the famous Tranz Alpine Express passing, explore the region by bike, or fish in nearby lakes. Not only a great place to eat, but a great place to drink some of the finest brewed beer in the country, as Monteiths is a leader in New Zealand's craft beer market. This bar and restaurant offers a unique experience where the menu is tailored to the variety of drinks provided. Have you been to any of these Greymouth attractions? Share your experience! Feedback: Very easy booking system to use. Feedback: Very efficient and fast. Chat was very helpful. Avis Greymouth Railway Station - Mackay Street, Greymouth, SI. Budget Greymouth Railway Station - Mackay St, Greymouth Railway Station, Greymouth, SI. Europcar Greymouth - Greymouth Railway Station, Greymouth, Greymouth, SI. Hertz Greymouth Railway Station - 164 Mackay St, Greymouth, SI. Thrifty Greymouth - 128 Mawhera Quay, Greymouth, SI.